Welcome to ReallyColor! 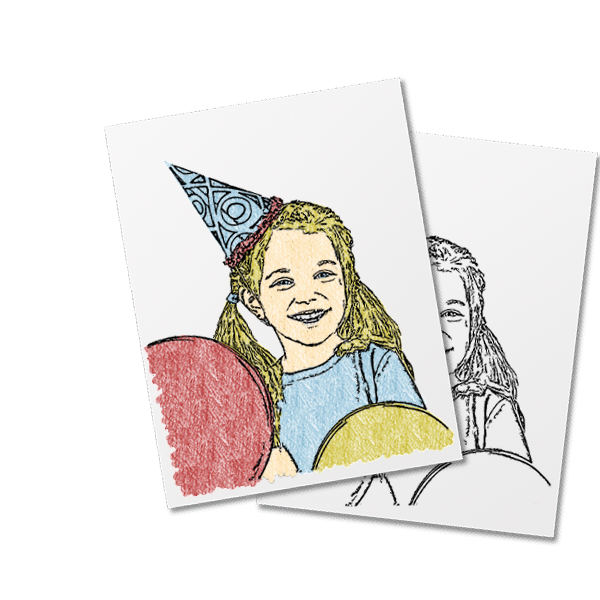 We are a Chicago-based business, which has developed patented technology that allows you to convert your own real world photos into printable coloring book pages. 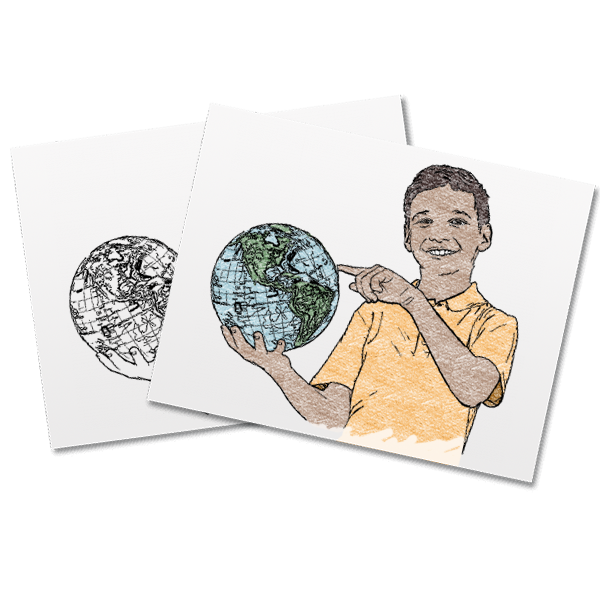 You can interact with a ReallyColoring Page on the web, your tablet or smartphone, and share online with family and friends. The idea for ReallyColor was sparked during a Friday night pizza party while our CEO, Dieter Marlovics, watched his daughter use her crayons and markers on tables, chairs, floors, clothes, walls, his hair, her friend's dog (but he got away), her shoes, and then explaining how she simply wanted to change the color of...well...everything! Always the rascal, she then pretended to start drawing on the wall, and Dieter dove in head first to stop her. Not wanting to stifle her artistic development, though, he took a picture of the wall, printed it out, and told her that she could go ahead and draw on the wall, but only on the piece of paper with the printed image. Dieter thought to himself how cool it would be for her to be able to color real things instead of the constant barrage of fictional cartoon characters. There were a few nervous sleepless nights spent staring at the ceiling, which ended in the morning with his laughing little girl jumping on him cannon ball style...Dieter wasn't laughing. He decided to build a prototype to see if coloring real photos could even be done well enough for at least his daughter and her friends to have fun with. The rest, as they say, is history. Dieter Marlovics is a technology entrepreneur who started his first business when he was 14 years old and, in 1997, co-founded his first technology startup called Hypermeals.com. Prior to founding ReallyColor, Dieter was a Partner and Chief Information Officer for Gelber Group, LLC, an algorithmic global proprietary trading firm. Under his leadership, Gelber Group successfully reinvented itself a number of times and evolved to become a multi-national technology powerhouse in the high frequency trading space. He has published various book chapters and articles touching on his experiences and vision of technology management and leadership. In addition to Dieter's various business interests, he is also a singer-songwriter managing production and global digital distribution for his band O.I.S. Dieter holds a Bachelor of Science degree in Electrical Engineering from Northwestern University and an MBA from Northwestern University's Kellogg School of Management. Matthew Klein is a marketing technology leader and software engineer with 17 years of experience growing business opportunities through entrepreneurship and digital technology. He comes to ReallyColor, LLC through his investment firm, Barn Star Ventures Inc., which is dedicated to investing resources and capital into early stage digital ventures. In 1998, Matthew co-founded and became CEO of Generator Corporation. Generator was focused on developing transactional B2B and B2C web applications for enterprise businesses such as Staples, Brunswick, Verizon, 3Com and U.S. Robotics. Prior to founding Barn Star Ventures and becoming co-founder of ReallyColor, Matthew was Founder and Chief Executive Officer of the pioneering digital media-marketing agency, FUOR Digital. In May of 2012, FUOR was acquired by Kelly, Scott & Madison (KSM). Matthew's leadership at FUOR was instrumental in delivering profitable business growth through digital media advertising campaigns for companies such as Cirque du Soleil, Florida Power & Light, Jimmy Johns, Bahamas Tourism, Herschend Family Entertainment, and Tootsie Roll Industries. Bill has 25 years of industry experience in image and signal processing, color science, and software development. He is currently Principal at Black Adder Research, a consulting and custom software development company specializing in image processing applications and iOS app development. Previously, Bill was a Color and Imaging Scientist and Color Science Team Lead at Eastman Kodak, where he attained Kodak Distinguished Inventor status with over 20 US patents. His work for Kodak and prior employers like 3M Company and Imation Corp. was primarily directed toward technology for the graphic arts such as halftoning, proofing, device profiling, and color management. Bill earned a Ph.D. in Electrical and Computer Engineering from Carnegie Mellon University with graduate work in automatic pattern recognition techniques for both images and speech. His interests include computer graphics, data visualization, image processing, mathematics, fitness, and exploring the world of wine. Keely has sold everything from scrap metal, to being involved with Mazda’s “Zoom Zoom” campaign, to pharmaceutical equipment, to classified U.S. military technology, and has formed relationships with top level corporate executives and political leaders around the world. She is a high-energy sales executive with an impressive track record spanning multiple countries, having lived and worked in the U.S., Afghanistan, United Arab Emirates (Abu Dhabi), and Uganda. At Velcro USA, Keely was promoted to National Account Manager during her first year and became the youngest national level sales executive in the company’s history. At United Scrap Metal, she independently orchestrated a complete market penetration of the highly competitive scrap-metal industry and single handedly captured more than seventy new accounts resulting in more than $4M in revenue with an unparalleled 98 percent customer retention rate. At Mavena Dermatologics, she managed the company’s first US-based treatment facility, ultimately generating 100 percent of its $400,000 quarterly revenue and directed a strategic corporate advertising campaign by leveraging print and television media, leading international trade show booth sales teams, and speaking at multiple public engagements. Keely holds a B.A. Degree in Marketing and Journalism from Michigan State University. Josh is the Founder and CEO of Table XI, an eleven-year-old digital strategy consultancy in Chicago. Table XI works with clients including the YMCAs of Chicago and New York City, Northwestern University, The Noble Network of Charter Schools, and PechaKucha. Beyond Table XI's work for established businesses and organizations, the company has backed numerous startups including PUSH Wellness Solutions, MyCouponDoc, and many others. A serial entrepreneur, in 2010 Josh co-founded Pegmo, an online and mobile customer loyalty platform for brands and local businesses. With Josh's help and guidance, Pegmo built a team, raised capital, brought its product to market, and sold itself to a large, publicly-traded marketing agency in 2012. In addition to his role with TableXI, Josh is the Managing Director of Ebert Digital where he oversees business strategy, operations, and product development. Jennifer is co-founder of Speech Language Literacy Lab, LLC, a company that specializes in turning research into practice in the areas of speech, language, and early literacy. Jen is co-author of the Kindergarten Language Benchmark Assessment (KLBA), a tool that allows schools to rapidly assess children in four areas correlated to future reading comprehension success in order to create early intervention groups and differentiate language difference from disorder. The KLBA is currently in a research development phase with Eastern Illinois University. Jen holds two masters degrees from Northwestern University in speech/language pathology and in learning disabilities. She also holds a masters degree in school administration from Loyola University, an Orton-Gillingham reading certification, a Hanen Center Early Intervention certification, and a DIR/Floortime certification for working with children with autism. She is also trained in the PROMPT method of articulation disorders. She has published several other teacher resource books, and presented at numerous national and state conventions in the areas of reading and language development. Tim is currently CEO/Founder of Agentis Energy based in Chicago. Agentis delivers energy-efficiency software applications to businesses for improved energy management through utility partnerships. Tim previously served as co-founder/Chairman and CEO of Commerx™. A pioneer in the development of Internet eCommerce systems, Tim was responsible for helping to direct and communicate the vision and growth strategies of Commerx. Through his aggressive promotion and strategic partnering, Tim successfully positioned Commerx as a leading provider of collaborative, Web-hosted supply chain solutions for industrial markets. In 2000, Commerx was awarded the Smithsonian/ComputerWorld technology award for innovation. Tim has been featured in top business publications including Business Week, Fortune, Forbes, Crain's Chicago Business, and Business 2.0 and is a frequent speaker at tech industry conferences. In early 2000, he was named one of 25 "E-Champions" by BtoB magazine and was a Top 10 finalist for the Ernst and Young Entrepreneur of the Year award.